Michele Bachmann for Senate in 2012? Minnesota Republican Rep. Michele Bachmann, a Tea Party favorite, isn't ruling out a 2012 bid for Senate. In a statement to the Hill on a possible run, Bachmann spokesperson Doug Sachtleben said that while Bachmann is presently focusing on her Congressional responsibilities, "nothing's off the table for the future." Buzz around a Bachmann Senate campaign has a lot to do with her ability to bring in money. The polarizing conservative congresswoman reported a record-breaking $13.2 million in fundraising for her 2010 re-election campaign to the House, surpassing all other House candidates and fueling speculation of a possible Senate bid against Democratic Sen. Amy Klobuchar. A recent poll by the democratic-leaning Public Policy Polling, which uses automatic polls, shows that Bachmann enjoys high favorability ratings among the state's Republicans. But it also gives Klobuchar a handy 15-point lead over Bachmann in a theoretical general election match-up. State Republican Party Chairman Tony Sutton told The Hill that Bachmann would be tough for Klobuchar to beat in a 2012 contest. "She's certainly got the fundraising horsepower, the political organization skills, and she's a great spokesperson," he said. Sutton added that "the kind of money raised in her congressional campaign would, in a Minnesota Senate race, be more than enough." Bachmann, who founded the House Tea Party caucus and is beginning her third term in Congress, has made no secret of her political ambitions: She briefly lobbied for the GOP conference chairmanship in next year's Congress - the fourth most powerful position in House leadership - before ending her bid because she could not generate sufficient support. There are serious questions about whether Bachmann, who trails perhaps only Sarah Palin when it comes to rankling liberals, could expand beyond her base and be a viable general election candidate, however. 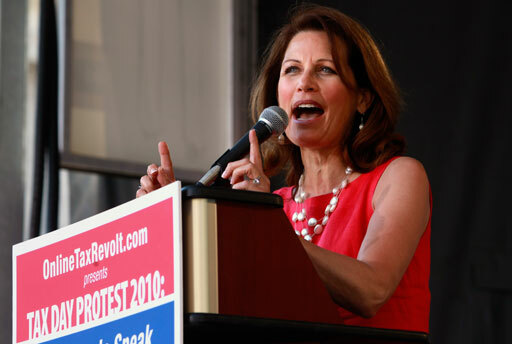 The PPP survey reports that of Klobuchar's potential GOP opponents for 2012, Bachmann is "the least well liked overall" in Minnesota, with a 37 percent favorable rating to a 51 percent unfavorable rating. Klobuchar spokesman Linden Zakula said the senator is currently focused on governing, not re-election. "The last election just concluded in our state and the senator believes that Minnesotans want their elected officials to get to work -- not focus on the next election," Zakula told the Hill in response to questions about a potential matchup against Bachmann. Under Minnesota state law, it would be difficult - if not impossible - for Bachmann to both enter the GOP Senate primary and simultaneously run for re-election to the House.